Over at Julie's: I have a secret . . . Bread Recipe!!! I have a secret . . . Bread Recipe!!! When Will goes out of town on business trips . . . I always make myself a special loaf of bread, one he never gets to eat! I also chill 2 cans of tuna because I love tuna and Will doesn't! I work so hard outside, doing Will's chores and mine when he's gone . . . I need to baby myself a bit! My secret bread recipe begins with basic French Baguette ingredients ~ bread flour, salt, water, yeast. You can't get more basic than that! 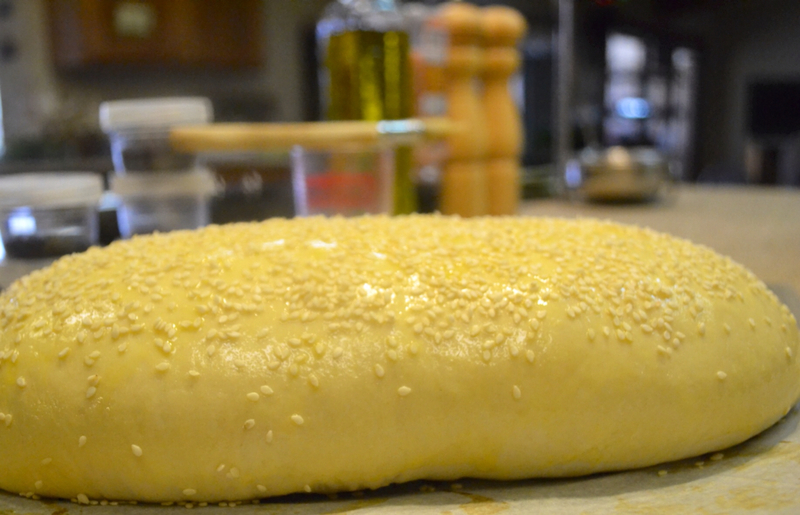 To this basic recipe I add brown sugar, an egg wash and as many sesame seeds as I can get to adhere to the bread! My Ultimate Comfort Bread comes out of the oven a beautiful golden brown, with a thin, crispy crust, sweet, nutty, toasted, sesame seeds and a delicate, soft, texture just begging to be slathered in sweet, creamery butter! So, for those who have a husband who travels, like mine, this may be your perfect carb fix while he's out of town! Or if you just need a special "pick-me-upper", this is your bread! 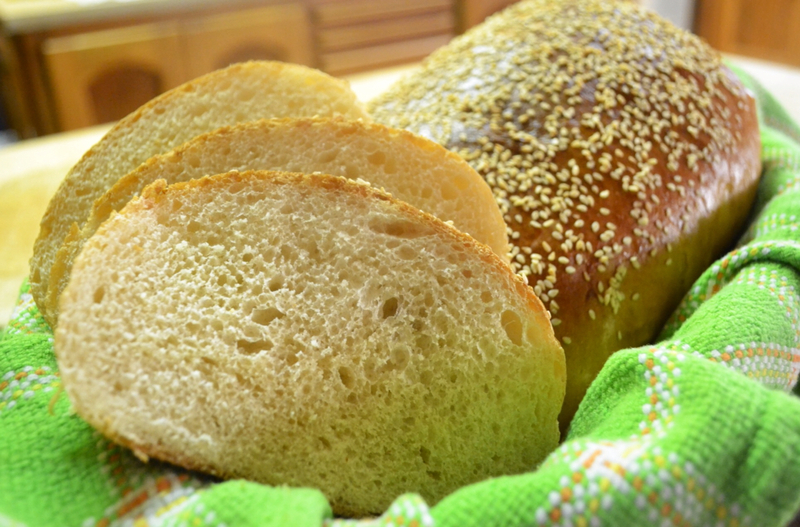 My Ultimate Comfort Bread will have you secretly plotting your next loaf, while your husband is busy packing his bags! Eat it plain, with butter, toasted, or as the best sandwich ev-er! It also makes some wonderful French Toast after day 3 . . . That is if there's any bread left! 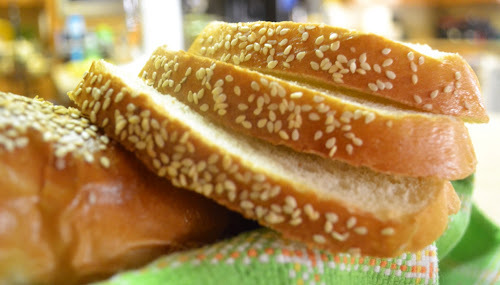 Add first 4 ingredients to bread machine pan in the order they appear in the above recipe. Make a shallow well in the center of flour, being careful not to expose the water; add yeast. Set bread machine to DOUGH CYCLE (1:30). When machine beeps, carefully remove dough (dough will be light and sticky). Gently pull dough away from the side of bread pan and add a sprinkling of flour to dough; this will make it easier to remove bread dough. 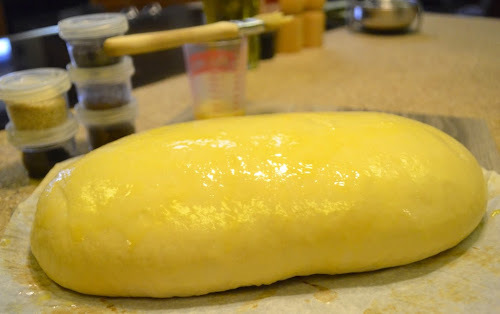 Place dough on a floured surface; form into an oblong bread loaf. Place bread on parchment covered baking sheet. Cover with tea towel or greased plastic wrap and let rise in warm, draft free spot until doubled, about 40 minutes total (I use my microwave oven light to rise my bread, closing the door to keep out drafts, while still keeping the light on). Julie's Tip: Set timer for 30 minutes. When timer goes off ~ Preheat oven to 350F. Set timer for an additional 10 minutes. When your timer goes off a second time, your bread will be ready for the egg wash and seeds and your oven will be up to temp. 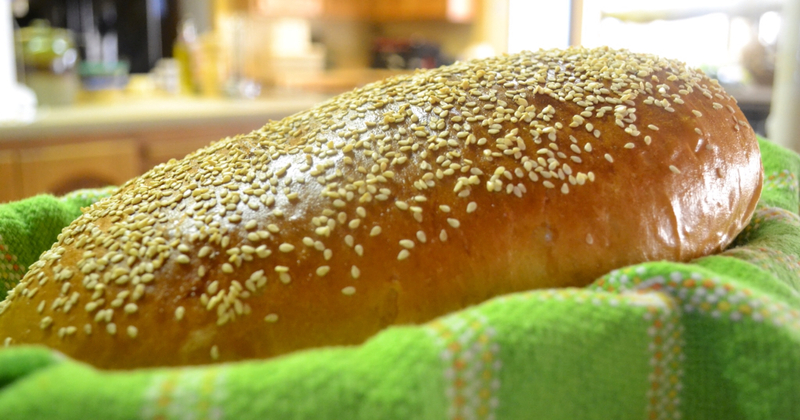 Brush risen bread with egg wash; sprinkle with seeds. Bake for 24 minutes, or until golden brown. Place bread on wire rack to cool before slicing. I hit it hard and heavy with sweet, nutty sesame seeds! My Ultimate Comfort Bread . . . pretty as a picture! Look at that perfect texture . . . Lots of crevices for butter! Okay, so I may spoil myself, just a little . . . You have your chocolate . . . I have my bread . . .
. . . Over at Julie's!!! Good Ham Deserves a Great Rye!